Starting with this funny quote from former Yankee’s catcher and clown Yogi Berra because it’s quite pertinent to the yoga process. AND I now have this policy of starting everything I do with a joke of some sort. I partly got this from something I learned when I was studying the Talmud in Jerusalem—it was about how this one rabbi always began his talks with a joke. And more recently, I’ve been very influenced by A Course in Miracles, which says that this whole mess began because someone forgot to laugh. Clearly jokes are great icebreakers—for you if no one else—so I commend this to you! 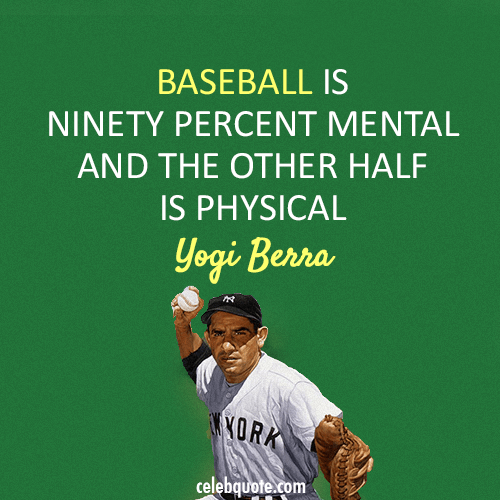 So let’s take the first part of the Yogi Berra quote: “Baseball is ninety percent mental…” and let’s just change one little word: “Yoga is ninety percent mental…” Yep, it sure is, let’s drop our preconceptions about what yoga is. It’s not just stretching, hopefully we’re clear on this by now! There’s a psycho-spiritual dimension of yoga that is unmistakable. In fact, it is actually the case that it is the very foundation of yoga, and the physical part is secondary and came later. Actually, we could even further and say that ultimately it’s all mental, if you understand the Mind in a more cosmic sense, but we’ll get to that later (maybe much later)! The ego manifests itself in the ongoing mental chatter that, when we tune into it, is constantly running and running interference with our “peace of mind.” It’s the proverbial “monkey mind” that never ceases, and comes in all of the negative self-talk with which we are so familiar that we think our thoughts are who we are. To this yoga says, no, who you are is beyond the “ego-mind,” all of these thoughts. And the process of yoga is the process of consciously dissolving this ego-mind to reveal our true Self, just as the sun is revealed when the clouds obscuring it are removed. So like your shoes, leave that ego at the door and begin taking the baby steps on the thousand mile journey back home. And… welcome home!